Slow release protein. Easy mixing, great taste! Effectively building muscle mass requires the correct timing when consuming your protein. Since proteins all have different absorption rates, it is best to know what type of protein to consume for the specific time of the day or night. 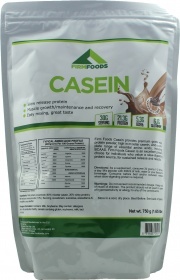 For a sustained and longer-lasting supply of protein to your muscles, it is best for you to try Firm Foods Casein! Compared to fast-digesting whey, casein protein works at a slower pace – and that is it's greatest strength! When casein enters the digestive tract, it begins to form a gelatinous material, which results in its slower rate of digestion. This leads to a sustained and steady release of amino acids into your muscles. Just like whey, casein is also a complete protein, which means that it has all the EAAs (Essential Amino Acids) and BCAAs (Branched Chain Amino Acids) needed for promoting muscle growth and recovery. When is the best time to consume Firm Foods Casein? Because of its slow digestion rate, it is best to consume Firm Foods Casein early in the morning to start your day, right before heading to bed (for all-night protein support), or for those times when you won't have access to a full meal or a protein shake for long time periods. Get your muscles' protein needs covered 24 hours a day, and get them on a steady path to growth, recovery, and development... try Firm Foods Casein today! Have a question about Casein? What is it, what does it do, how and when to use or something else? Ask us. “Casein 750g” is currently out of stock. Enter your details below and we will let you know when it's back in stock. “Casein 1.5kg” is currently out of stock. Enter your details below and we will let you know when it's back in stock. “Casein 2.25kg” is currently out of stock. Enter your details below and we will let you know when it's back in stock. As a supplement, consume 30 grams 1-2 times a day. Mix powder with 300ml of milk, water or your favorite beverage. Consume before bed and/or between meals when slow-digesting protein is required. WARNINGS Casein : Do not exceed recommended daily dosage! Keep out of reach of children. The product should not be used in case of hypersensitivity or allergy to any of the ingredients of the formulation. Food supplements should not be used as a substitute for a varied and balanced diet and healthy lifestyle. Store in a cool, dry place. Please Recycle. BEST BEFORE: Please see lot number and expiration date stamped on the packaging.